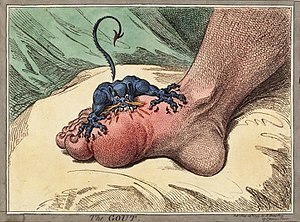 A typical case of gout attacks the big toe. ‘Attack’ is the critical word. As these two images demonstrate, gout usually effects the metatarsophalangeal joint – the joint where the toe joins the foot. However, the toe joints themselves may be involved, becoming red, hot, swollen, and PAINFUL. Most patients say they can’t stand a sheet to touch their toes when gout flares. Other joints may also be effected. By the time a gouty toe becomes this inflamed (which may happen overnight or over the course of a few days) the patient wants relief – NOW. There are several ways of treating gout, but first, what is gout anyway? Gout is a form of arthritis brought on by the body’s reaction to uric acid crystals in the joint fluid. Under normal conditions the concentration of uric acid in synovial fluid is too low to form crystals. However, if blood uric acid levels are high, joint fluid uric acid levels elevate, sometimes allowing crystals to form. If uric acid levels remain elevated for prolonged periods, tophi may occur. These are areas where the crystals accumulate to the degree they make lumps or nodules, somtimes breaking through the skin. Doctors rarely see this nowadays, since medication exists to prevent the condition from advancing this far. As for treatment, the disease should be divided into acute gout and chronic gout. Acute gout is treated with colchicine or antinflammatory medication. If you are sure of your diagnosis (note – other conditions may mimic gout) you can treat yourself at home with full doses of over-the-counter ibuprofen, aspirin, or naproxen for under $10. These not only help the pain, but interfere with the inflammatory process, thus relieving redness and swelling as well. (Tylenol may ease the discomfort, but will not decrease inflammation.) For patients who cannot tolerate these medicines, prescription Celebrex is an alternative (but expensive), or even short-term steroids (cheap). An acute case of gout requires only a week or so of medication. Anyone who’s had one case of gout won’t want another. There are several factors which can decrease the likelihood of a repeat occurrence. First, if you are taking medication for other reasons, ask your doctor if they may be elevating your uric acid level. This is most common with diuretics (water pills). Second, learn what foods to avoid. Limit meat and alcohol intake, especially beer. For more details, read this information from the Mayo Clinic: http://www.mayoclinic.com/health/gout-diet/MY01137. For patients with frequent recurrences or chronic gout, the answer is usually to take allopurinol to decrease the blood level of uric acid, at a cost of $10-20 a month. (Allopurinol is not used for an acute attack, and may actually worsen the condition.) Save money on doctor visits by asking for a year’s prescription once your uric acid level is under control. Ask your doctor how often this needs to be checked. Once a year (or less) is usually often enough for bloodwork. 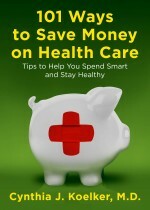 Keeping the condition under control will also prevent expensive trips to the ER. This is definitely a case of when an ounce of prevention is worth a pound of cure. This entry was posted in Arthritis, Gout, Gouty arthritis and tagged Allopurinol, Arthritis, Gout, Inflammation, Musculoskeletal Disorders, Uric acid. Bookmark the permalink. I just got rid of my gout… I’m so happy I’d been struggling with it it seems like my whole life.